In 1984 the Labour government cut back the state sector, selling many state enterprises and reducing others. Wellington bore the brunt, and thousands of public servants were made redundant. 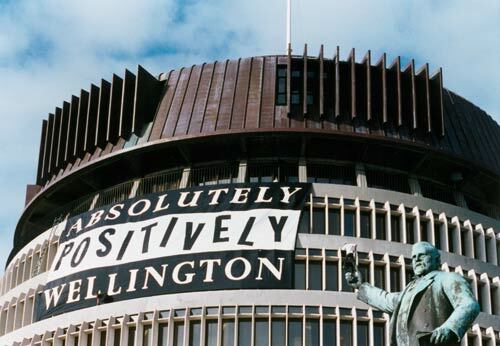 In 1990 the city’s main newspaper group and an advertising agency coined the phrase ‘Absolutely Positively Wellington’ to revitalise the city’s spirit. A marketing campaign highlighting Wellington’s attributes helped transform its image and in 1992 the phrase became the city’s slogan. In the same year this huge banner was hung on the side of the Beehive building at Parliament.